Google may have to make changes to its Android phones as part of a settlement deal brokered with Brussels over its alleged anti-competitive behaviour. The European Commission has been investigating Google since 2010 following complaints from rivals. Google has proposed making changes to the way it handles search to head off a lengthy court case and large fines. But Brussels' acceptance of the proposal hinges on the changes being extended to Android, reports the FT. The Competition Commission in Brussels has been looking into whether Google favours its own results and hinders rivals when it serves up the results of searches. It is also investigating which ads are served alongside results and whether Google is inhibiting marketers' ability to buy adverts elsewhere. Talks over Brussels' worries and Google's proposals for dealing with them were ongoing and, said the FT, close to a resolution. However, it said, talks had hit a sticking point brought about by competition commissioner Joaquin Almunia's late inclusion of Android in the settlement deal. Mr Almunia is known to prefer reaching a settlement through negotiation rather than a trial. Google's agreement to include Android and ensure the changes it makes to web searches apply to its phones as well would mean that talks continued. Without this agreement, Mr Alumnia's office was likely to decide to proceed with legal action as early as next week, said the paper. A spokesman for Mr Almunia's office told the BBC he had no comment to make on the FT story. "We are analysing the proposals that Google has sent us and we are also discussing with them in order to clarify some aspects," he said. "But we are still in the contact-and-discussion phase. "We cannot pre-judge what this could lead to, be it a possible settlement or standard procedure," he added. 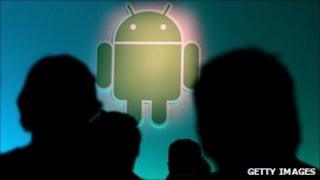 A Google spokesman said it had no comment to make on reports about Android. "We have made a proposal to address the four areas the European Commission described as potential concerns," he said. "We continue to work cooperatively with the Commission." Chris Watson, head of the telecoms practice at legal firm CMS, said the inclusion of Android might signal a shift in the way Brussels views the tech industry. "What's I find interesting about this is that it shows a convergence of the fixed and mobile telecoms market," he said. With the late addition of mobile to the talks, he said, Brussels could be signalling that it sees telecoms as a unified market and recognises Google's influence across the sector.